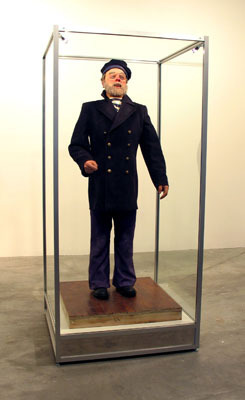 Gavin Turk, Gentleman Jim, 2005, mixed media, 84 7/16 x 39 3/8 x 39 3/8". Gavin Turk notoriously concluded his MFA at the Royal College of Art in London with a cocksure forecast of future esteem, installing in an otherwise empty room an English Heritage plaque, BOROUGH OF KENSINGTON / GAVIN TURK / SCULPTOR / WORKED HERE / 1989–1991. That Turk has since burned less brightly than many of his YBA contemporaries is possibly the price of being a gadfly: His investigations into how artistic value gets conferred—particularly through the cults of originality and personality, which he evinces through fusions of existing iconographies, from Warhol’s to Magritte’s, David’s to Duchamp’s—persuasively construe the art world as built on sand. Expect his first museum survey, curated by Roel Arkesteijn and featuring some forty of his sculptures, photographs, and drawings, as well as a recent series of screenprinted self-portraits, to mix physical fullness with spiritual vacancy.